The Washington Capitals wrap up their longest road trip of the season on Tuesday night when they face the Toronto Maple Leafs at Air Canada Centre in the Caps’ penultimate road game of the regular season. The Caps clinched a winning road trip with their 3-2 win over the Columbus Blue Jackets on Sunday night, but they would like to make it four out of five on the trip, as well as avenge a 4-2 loss on the ACC ice sheet last November 26th. The Maple Leafs come into this game as one of the most exciting stories of the 2016-2017 season, angling to return to the postseason for the first time since the 2012-2013 season and for only the second time since the 2004-2005 lockout. Toronto carried a three-game winning streak through the weekend and into their game against the Buffalo Sabres on Monday night in advance of the Caps’ visit. It is part of a run in which the Leafs are 10-2-1 over their last 13 games, carrying them into third place in the Atlantic Division, one point behind the Boston Bruins with two games in hand on the B’s (pending the result against the Sabres). By now, many hockey fans are aware that the Maple Leafs have dressed nine rookie skaters this season, seven of them appearing in at least 50 games in the blue and white. Six of them have at least 25 points, and five of them have at least 10 goals. And nowhere are they stronger among their rookies than at forward. Auston Matthews (38-28-66), William Nylander (22-37-59), and Mitch Marner (18-41-59) rank first and tied for third in points, respectively, among the league’s rookies through Sunday’s games. Matthews’ 38 goals this season is the third highest total for a rookie since the 2004-2005 lockout, and it is a Toronto franchise record for a rookie. Only Alex Ovechkin (52) and Sidney Crosby (39), both in 2005-2006, surpassed Matthews’ rookie goal total. His 66 points is the ninth highest rookie point total in that span of time and with three more points would tie Brad Boyes (2005-2006) and Nicklas Backstrom (2007-2008) for seventh place on that list. He heads into the weekday games on a roll, recording goals in each of his last four games (five in all) and in six of his last eight contests (seven goals). He has point in eight straight games, tying his longest streak of the season (Games 31-38 in late December and early January). If there is an odd thing about Matthews’ record this season, it is that more ice time is not necessarily a good thing. In games in which he skated 17:30 or more, Toronto is 13-18-11. The Leafs are 25-6-4 when he skated less than 17:30. He is 1-2-3 in two games against the Caps this season. William Nylander’s first full season in the NHL (he played in 22 games in 2015-2016) has been as productive as Leafs fans might have hoped when he was taken with the eighth overall pick in the 2014 draft. His 22 goals ranks tied for 14th (with Gus Bodnar in 1943-1944) all-time on the Toronto rookie goal scoring list. It is not inconceivable that he could finish in the top ten, surpassing Sergei Berezin’s 25 goals as a rookie in the 1996-1997 season. He has been a point-making machine in the last two months. Since February 4th, when he scored a hat trick in a 6-5 win over Boston, Nylander is 12-16-28 in 28 games, and he has points in 13 of his last 14 contests. Nylander, though, is another player for whom more ice time might not be the best situation. In games in which he skated 16:28 or more this season, Toronto is 9-11-11. The Leafs are 28-13-4 in the other 45 games in which he appeared. He is 0-1-1, minus-1, in two career games against the Capitals. Mitch Marner is the third member of the top trio for the Leafs, another recent high draft pick doing well (fourth overall in 2015). Although he might be less heralded than either Matthews or Nylander, he has been no less productive. His 18 goals rank just sixth on the club overall, but five of them are game-winners, and he is third on the club in power play points (19). With another two goals, he would become the 26th rookie in Maple Leafs’ history to finish with 20 or more goals. With another point, he could become just the fourth (or fifth, depending on what Nylander does) rookie in Toronto history to finish their first season with 60 or more points, joining Matthews (66 points so far), Peter Ihnicak (66 points in 1982-1983) and Gus Bodnar (62 points in 1943-1944). But like his two fellow rookie travelers, more ice time has been an issue this season. The Leafs are 5-10-7 in games in which Marner skated more than 17:30, 31-13-6 in the other 50 games in which he dressed. He is, relative to Matthews and Nylander, in a bit of a slump at the moment. After putting together a five-game points streakto start March, he is 1-4-5 in his last ten contests. Marner is 1-3-4, minus-2, in two career games against Washington. 1. Since March 7th, when the Leafs embarked on their 10-2-1 run, they have the fourth-most points earned in the league (21). St. Louis (24), Anaheim (23), and Carolina…yes, Carolina (22) are the only ones with more. 2. Toronto is tied for fourth in total goals scored in that span (44, with Edmonton), trailing Carolina (49), Philadelphia (47), and Boston (46). Toronto and Edmonton lead in average goals per game over that span (3.38). 3. The Maple Leafs have the third-best power play in the league over those 13 games (31.4 percent), trailing the Caps (31.7 percent) and Buffalo (39.3 percent). 4. Odd fact… Toronto has just 11 wins this season when outshooting their opponents, 26 wins when they are outshot. You might think that as prolific and precocious a team as the Leafs would have more games outshooting their opponents that being outshot. They do not; they have 30 games outshooting their opponents (11-12-7), while having 46 games being outshot by opponents (26-12-8). They are 1-0-0 when having the same number of shots on goal as their opponent. 5. Even with their recent success in the win-loss columns, Toronto is no possession beast. They rank 26th in overall shot attempt shares (47.87 percent) over those 13 games in their 10-2-1 run (numbers from NHL.com). 1. In the 2017 portion of the season, Washington has played 25 games against teams currently playoff eligible. They have a record of 18-5-2 against those clubs, 11-2-1 against Eastern teams and 7-3-1 against Western teams. 2. In those 25 games, the Caps outscored their opponents, 88-63 (3.52/game – 2.52/game) and outshot their opponents by 748-717 (29.92/game to 28.68/game). 3. On special teams, the Caps have a 24.7 percent power play and an 81.7 percent penalty kill in those 25 games. They scored two shorthanded goals and allowed one. 4. Only once in those 25 games against current playoff-eligible teams did the Caps lose consecutive games – March 9th and 12th to the San Jose Sharks (4-2) and to the Anaheim Ducks (5-2). The Caps are 11-0-1 against those eligible teams at home, 7-5-1 on the road. 5. After going five straight games against those clubs allowing four or more power play opportunities, the Caps have allowed just 11 power play chances in their last five games against playoff eligible teams, four times allowing two or fewer. The Maple Leafs have dressed four goalies this season – Jhonas Enroth, Antoine Bibeau, and Curtis McElhinney have combined to appear in 19 games. However, as much as Toronto has realized from their class of rookie skaters, how successful they are in the postseason could come down to how well Frederik Anderson plays in goal. Andersen is just the third goaltender for the Leafs since the 2004-2005 lockout to reach the 30-win mark. His 32 wins this season are one short of Vesa Toskala’s 33 wins in 2007-2008 and five shot of Andrew Raycroft’s 37 wins in 2006-2007. He and Jonathan Bernier in 2013-2014 are the only goalies playing at least 2,500 minutes in a season to record a goals against average of under 2.75 and a save percentage over .915. Andersen might be the best of an iffy lot of goaltenders over the last dozen or so seasons for Toronto, but he would appear to justify the description as “best.” He has not lost a decision in regulation since March 14th (7-2 to Florida), going 5-0-1 (one no-decision), 2.03, .943, with one shutout in seven appearances. Andersen is 2-0-1, 2.67, .909, with one shutout in three career appearances against the Capitals. Brooks Orpik has had an odd sawtooth patter to his offense over the past five years, including this one. In 2012-2013, with the Pittsburgh Penguins, he did not record a goal in 46 games. The following year he had a pair in 72 games for the Pens. Then he moved to Washington and did not record a goal in 78 games. Last season, in a year cut back to 41 games due to injuries, he still managed to record three goals, a career high. This season, alas, he is once more without a goal. What is odd about this season’s absence of a goal on Orpik’s scoring line is that he already has a career high in shots on goal (81), surpassing the 66 shots he had on goal for the Caps two years ago, also without a goal. He does have, however, 14 assists, the eighth season he hit double digits in helpers over his 14-year career. His points have come largely at home this season (10 of his 14 assists). Orpik has not had a point on the road since January 31st, an assist in a 3-2 loss to the New York Islanders in Brooklyn. In 39 career games against the Maple Leafs, Orpik is looking for his first goal. He has nine assists and in minus-6. It would be natural for a team to experience a bit of a letdown after the hard-fought win in Columbus on Sunday evening. Toronto is the kind of team that can take advantage of that with the offensive skill they possess. 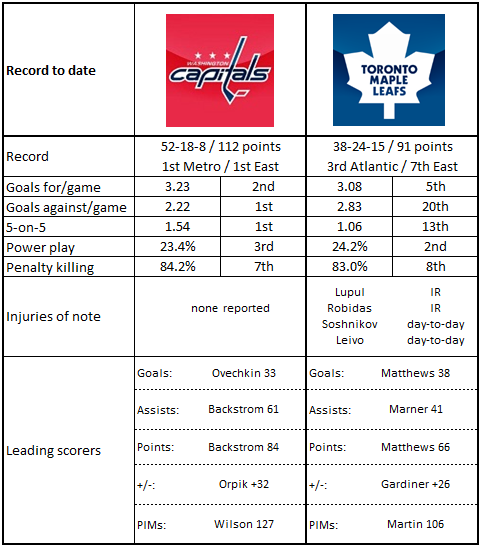 This shakes out as one of those “discipline” kinds of games, where the Caps dictate pace, bending the Maple Leafs to a style of their choosing. It is something that the Caps have been pretty good at in the 2017 portion of the season, especially against the better teams in the league. And after years of waiting, Toronto fans can say that this edition of the Maple Leafs is among the better teams in the league. Beware.